In 1834, Smith wrote the first description of a rupture of the rotator cuff tendon. Since then, with the work of such authors as Duplay, Von Meyer, Codman, and Neer, degenerative changes to the rotator cuff have been better characterized; however, the exact mechanisms leading to the degeneration of the rotator cuff still are debated today. [1, 2, 3, 4, 5, 6, 7, 8] Moreover, despite numerous trials, questions still exist about the efficacy of different therapeutic modalities for rotator cuff disease. With the help of better methodology for studies, more successful treatment of degenerative rotator cuff disease can be expected. See the images below. This image depicts the channel between the articular capsule and the subacromial-subdeltoid bursa in a complete rotator cuff tear. Even if the channel cannot be always identified, the presence of contrast medium in the subdeltoid-subacromial bursa signs the presence of a complete rotator cuff tear. Impingement of the rotator cuff beneath the coracoacromial arch is an established cause of chronic shoulder pain. In 1972, Neer, in a landmark article, described and popularized the term impingement syndrome. Observations from cadaver studies and surgery gave evidence that impingement occurs against the under surface of the anterior third of the acromion, the coracoacromial ligament, and at times, the acromioclavicular joint. Located anterior to the coracoacromial arch in the neutral position, the supraspinatus tendon insertion to the greater tuberosity and the bicipital groove must past beneath the arch with forward flexion of the shoulder, especially if internally rotated, causing an impingement. His works showed that degenerative tendinitis and tendon ruptures were centered in the supraspinatus tendon, extending at times to the anterior part of the infraspinatus tendon and the long head of the biceps tendon. Neer believed that 95% of tears of the rotator cuff were initiated by impingement wear, rather than circulatory impairment or trauma. He observed proliferative traction spurs at the undersurface of the anterior acromion that he explained by the repeated impingement of the cuff (see the image below). He stated that the variation in shape and slope of the acromion could make people more susceptible to impingement and tear, making it appear logical to perform an anterior acromioplasty at the time of every cuff repair. 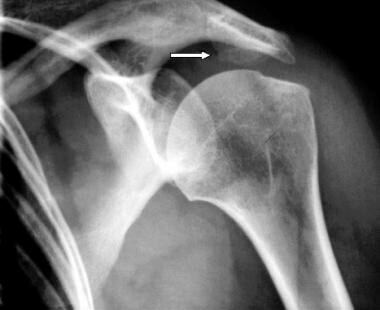 Presence of a bony spur on the inferior surface of the acromion. Only 3% of tears are associated with a type 1 acromion. Although there is a strong association between cuff tears and hook acromia, it is unclear whether the shape is the cause or the result of the cuff tear or simply the result of aging; however, Ozaki et al's study on cadavers showed that the undersurface of the acromion was normal when the incomplete tear was on the articular side. On the other hand, when the incomplete tear was on the bursal side of the cuff tendon, pathological changes of the under surface of the acromion were observed, suggesting that a hooked acromion is the result of the cuff tear on the bursal side of the tendon and not the cause. 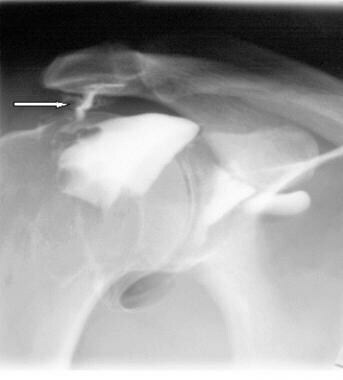 Nevertheless, curved and hooked acromia appear to be due to a degenerative process with formation of the osteophyte-enthesophyte complex at the acromion-coracoacromial ligament junction that is increasingly prevalent with age. See the image below. Slight hyperintensity signal within the tendon without transsectional hyperintensity throughout the tendon is compatible with tendinopathy without complete tear. Additionally, note the presence of the hyperintensity signal in the region of the subdeltoid-subacromial bursa, which indicates bursitis. In stage 1, edema and hemorrhage result from excessive overhead use and are observed in patients younger than 25 years. In stage 2, fibrosis and tendinitis affect the bursa and the cuff following repeated episodes of mechanical inflammation in patients aged 25-40 years. In stage 3, bone spurs and incomplete and complete tears of the rotator cuff and long head of the biceps tendon are found almost exclusively in patients older than 40 years. Clinical course and treatment vary according to the stage of the disease process. Neer's picture of the impingement syndrome may explain tears on the bursal (superficial) side of the tendon. However, partial tears most commonly involve the articular (deep) side of the tendon, as observed by many investigators. Other etiologies, then, must be considered to explain the rotator cuff degeneration. In 1991, Walch et al described, from arthrographic observations, an impingement occurring between the articular side of the supraspinatus tendon and the posterosuperior edge of the glenoid cavity. With the shoulder held at 120° of abduction, retropulsion, and in extreme external rotation (similar to the late cocking phase in throwers), the labrum moves away from the glenoid and the glenoid rim comes in contact with the deep surface of the tendon, producing repeated microtrauma and leading to partial tears. This process has been confirmed by MRI studies and may explain some of the articular side tears, especially in overhead sport athletes; however, it does not account for all the tears observed in older patients. In 1985, Gerber described, from CT scan studies and from surgery observations, impingement of the cuff in the coracohumeral interval. He demonstrated that, when the shoulder is held in flexion and internal rotation, the coracohumeral distance is reduced from 8.6 mm when the arm is at the side to 6.7 mm. In this position, the lesser tuberosity, and also the biceps tendon and the supraspinatus tendon, become closer to the coracoid process, creating subcoracoid impingement and cuff lesions. Subcoracoid impingement can be idiopathic (eg, large coracoid tip), iatrogenic (eg, following a Trillat procedure) or following a fracture (eg, humeral head or neck fracture). In this theory, the lesions result from progressive age-related degeneration of the tendon. Von Meyer was probably the first to introduce the concept that degeneration of the tendon plays a major role in the production of cuff lesions. Many histologic studies show the age-related degeneration of the cuff tendon; however, it is not the purpose of this article to describe those numerous changes. Observations from various sources (eg, cadaver, surgical, MRI, ultrasonographic, arthrographic studies) show that cuff tears rarely are seen in patients before age 40 years and that the number observed after the patient has reached 50 years increases progressively. In 1934, Codman introduced the concept that most tears originate on the articular side of the tendon. Since that time, many authors have come to support that theory from cadaver, surgery, and MRI observations. Most of the tears have been observed on the articular surface of the tendon, near its insertion on the greater tuberosity, in an area Codman called the critical zone. This zone appears to be at greater risk of developing a tear. To explain why the critical zone is more prone to tearing, some investigators have suggested that it is a poorly vascularized area. Histologic, cadaver, and Doppler studies show that the articular side of the tendon, near its insertion on the tuberosity, is relatively avascular when compared to the remainder of the cuff. By contrast, some other authors did not support these observations and found no difference in vascularity when the critical zone was compared to the other parts of the cuff. On the other hand, Rathbun suggested that the relative avascularity of the cuff is position-dependent and observed a poor filling only when the shoulder is in adduction. Finally, Nixon stated that the critical zone is an area of anastomoses between the muscular vessels and the osseous vessels. The most recent studies suggest that the critical zone is not an avascular area. The normal degenerative process associated with aging, then, is the main factor to explain the lesions of the articular side of the cuff. The scar tissue of the healing tendon lacks the normal resilience of tendon and, therefore, is under increased risk for failure. In the absence of repair, the degenerative process tends to continue through the substance of the supraspinatus tendon to produce a full thickness defect in the anterior supraspinatus tendon. The full thickness tear tends to concentrate loads at its margin, facilitating additional fiber failure with smaller loads than those that produced the initial defect. Once a supraspinatus tendon defect is established, it typically propagates posteriorly through the remainder of the supraspinatus tendon, then into the infraspinatus tendon. With the increasing defect of the cuff tendon, the spacer effect of the cuff tendon is lost (as well as its stabilizing effect), allowing the humeral head to displace superiorly, placing increased load on the biceps tendon (see the image below). As a result, the breadth of the long head tendon of the biceps is often greater in patients with cuff tears in comparison with uninjured shoulders. In chronic cuff deficiency, the long head tendon of the biceps frequently is ruptured. Superior migration of the humeral head in chronic, complete rotator cuff tear. Note the reduced space between the acromion and the humeral head. Further propagation of the cuff defect crosses the bicipital groove to involve the subscapularis tendon, starting at the top of the lesser tuberosity and extending inferiorly. As the defect extends across the bicipital groove, it may be associated with rupture of the transverse humeral ligament and destabilization of the long head tendon of the biceps, allowing its medial displacement. The concavity compression mechanism of glenohumeral stability is compromised by cuff disease. Beginning with the early stage of cuff fiber failure, the compression of the humeral head becomes less effective in resisting the upward pull of the deltoid. A partial thickness cuff tear causes pain on muscle contraction. This pain produces reflex inhibition of the muscle action. In turn, the combination of reflex inhibition and loss of strength from fiber detachment makes the muscle less effective for balance and stability; however, as long as the glenoid cavity is intact, the compressive action of the residual cuff may stabilize the humeral head. When the weakened cuff cannot prevent the humeral head from rising under the pull of the deltoid, the residual cuff becomes squeezed between the humeral head and the coracoacromial arch, contributing to further cuff degeneration. Degenerative traction spurs develop in the coracoacromial ligament, which is loaded by pressure from the humeral head. Upper displacement of the humeral head also wears on the upper lip of the glenoid rim and labrum, reducing the effectiveness of the upper glenoid concavity. Further deterioration of the cuff allows the tendon to slide down below the center of the humeral head, producing a boutonnière deformity. The cuff tendons become humeral head elevators, rather than head compressor-depressors. Just as in the boutonnière deformity of the fingers, the shoulder with a buttonholed cuff is affected by the conversion of balancing forces into unbalancing forces. This theoretical model on the continuum of the cuff degeneration demonstrates the result of many years of overuse, but this process is also the consequence of the phenomenon that happened when human beings first stood erect. That development led to the use of the glenohumeral joint in a biomechanically unusual way (eg, repetitive overhead activities, arm length activities, throwing). The extremely long lever arm of the upper limb leads the short lever arm cuff muscles to produce extremely high forces in order to stabilize the joint, in opposition to the upward pull of the humeral head by the deltoid and preventing the impingement of the cuff, but at the expense of overload and degeneration. In summary, the pathophysiology of rotator cuff degeneration may be explained by a combination of extrinsic, intrinsic, and biomechanical factors; however, it is not understood why in some individuals those pathological changes cause pain, but not in some others. This question should keep investigators busy for many years to come. Shoulder pain is the third most common cause of musculoskeletal disorder after low back pain (LBP) and cervical pain. Estimates of the cumulative annual incidence of shoulder disorders vary from 7-25% in Western general population. The annual incidence is estimated at 10 cases per 1000 population, peaking at 25 cases per 1000 population in the age category of 42-46 years. In the population aged 70 years or more, 21% of persons were found to have shoulder symptoms, most of which were attributed to the rotator cuff. In cadaver studies, the incidence of full thickness tears varies from 18-26%. The incidence of partial thickness tears varies from 32-37% after age 40 years. Before 40, tears rarely are observed. In MRI studies, tears have been observed in 34% of asymptomatic individuals of all ages. After 60 years, 26% of patients have partial thickness tears, and 28% demonstrate full thickness tears. The above data are derived from international literature. No known regional variation exists for the frequency of this disease. As mentioned before, shoulder pain is the third most common cause of musculoskeletal disorder after low back and neck pain. Although considered a benign condition, according to a study on the long-term outcome of rotator cuff tendinitis, 61% of the patients were still symptomatic at 18 months, despite receiving what was considered sufficient conservative treatment. Moreover, 26% of patients rated their symptoms as severe. Musculoskeletal disorders are the primary disabling conditions of working adults. The prevalence of rotator cuff tendinitis has been found to be as high as 18% in certain workers who performed heavy manual labor. Webster and Snook estimated that the mean compensation cost per case of upper extremity work-related musculoskeletal disorder (MSD) was $8070 in 1993; the total US compensable cost for upper extremity, work-related MSDs was $563 million in the 1993 workforce. The compensable cost is limited to the medical expenses and indemnity costs (lost wages). When other expenses (eg, full lost wages, lost production, cost of recruiting and training replacement workers, cost of rehabilitating the affected workers) are considered, the total cost to the national economy becomes much greater. The impact of rotator cuff disease on the quality of life (QOL) is even more difficult to assess than its cost. Further studies using valid methods like the Medical Outcomes Study (MOS) 36-item short-form health survey (SF-36), measuring the impact of the disorder on the general health should assess this issue. No known race variation associated with rotator cuff disease is cited in the literature. In one study, there is a predominance of male patients (66%) seeking consultation for rotator disease, but, in other studies, the male-to-female ratio is 1:1. Rotator cuff disease is more common after age 40 years. The average age of onset is estimated at 55 years. Codman EA. The shoulder. In: Thomas T, ed. Rupture of the Supraspinatus Tendon and Other lesions in or About the Subacromial Bursa. Boston:. 1934. Duplay. Rotator Cuff Disease. Arch Gén Méd. 1872. 2:513. Neer CS 2nd. Impingement lesions. Clin Orthop. 1983 Mar. (173):70-7. Von Meyer AW. Chronic functional lesions of the shoulder. Arch Surg. 1937. 35:646-674. Von Meyer AW. Further observations upon use-destruction in joint. J Bone Joint Surg. 1922. 4:491-511. Von Meyer AW. Further evidence of attrition in the human body. Am J Anat. 1924. 34:241-260. Von Meyer AW. The minute anatomy of attrition lesions. J Bone Joint Surg. 1931. 13A:341. Oliva F, Piccirilli E, Bossa M, et al. I.S.Mu.L.T - Rotator Cuff Tears Guidelines. Muscles Ligaments Tendons J. 2015 Oct-Dec. 5 (4):227-63. [Medline]. [Full Text]. Longo UG, Berton A, Papapietro N, Maffulli N, Denaro V. Epidemiology, genetics and biological factors of rotator cuff tears. Med Sport Sci. 2012. 57:1-9. [Medline]. Bigliani LU. The morphology of the acromion and its relationship to rotator cuff tears. Orthop Trans. 1986. 10:228. Ozaki J, Fujimoto S, Nakagawa Y, et al. Tears of the rotator cuff of the shoulder associated with pathological changes in the acromion. A study in cadavera. J Bone Joint Surg Am. 1988 Sep. 70(8):1224-30. [Medline]. Walch G, Liotard JP, Boileau P, Noel E. [Postero-superior glenoid impingement. Another shoulder impingement]. Rev Chir Orthop Reparatrice Appar Mot. 1991. 77(8):571-4. [Medline]. Rathbun JB, Macnab I. The microvascular pattern of the rotator cuff. J Bone Joint Surg Br. 1970 Aug. 52(3):540-53. [Medline]. Nixon JE, DiStefano V. Ruptures of the rotator cuff. Orthop Clin North Am. 1975 Apr. 6(2):423-47. [Medline]. Matsen FA 3rd. Practical Evaluation and Management of the Shoulder. Philadelphia:. WB Saunders Co. 1994:1-242. Matsen FA 3rd. Rotator cuff. In: Rockwood CA Jr, Matsen FA, eds. The Shoulder. 3rd ed. Philadelphia:. WB Saunders Co. 1998:755-839. Keener JD, Wei AS, Kim HM, et al. 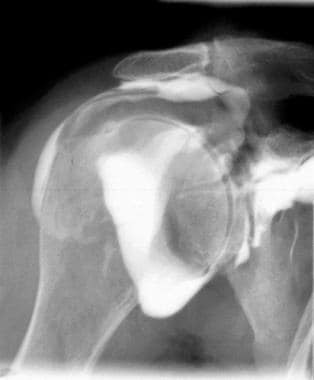 Proximal humeral migration in shoulders with symptomatic and asymptomatic rotator cuff tears. J Bone Joint Surg Am. 2009 Jun. 91(6):1405-13. [Medline]. [Full Text]. Longo UG, Berton A, Ahrens PM, Maffulli N, Denaro V. Clinical tests for the diagnosis of rotator cuff disease. Sports Med Arthrosc. 2011 Sep. 19(3):266-78. [Medline]. Ackland DC, Pandy MG. Lines of action and stabilizing potential of the shoulder musculature. J Anat. 2009 May 28. [Medline]. Leroux JL, Thomas E, Bonnel F, Blotman F. Diagnostic value of clinical tests for shoulder impingement syndrome. Rev Rhum Engl Ed. 1995 Jun. 62(6):423-8. [Medline]. Gerber C, Krushell RJ. Isolated rupture of the tendon of the subscapularis muscle. Clinical features in 16 cases. J Bone Joint Surg Br. 1991 May. 73(3):389-94. [Medline]. [Full Text]. Seyahi A, Demirhan M. Arthroscopic removal of intraosseous and intratendinous deposits in calcifying tendinitis of the rotator cuff. Arthroscopy. 2009 Jun. 25(6):590-6. [Medline]. Yoo JC, Ahn JH, Yang JH, et al. Correlation of arthroscopic repairability of large to massive rotator cuff tears with preoperative magnetic resonance imaging scans. Arthroscopy. 2009 Jun. 25(6):573-82. [Medline]. Pegreffi F, Paladini P, Campi F, Porcellini G. Conservative management of rotator cuff tear. Sports Med Arthrosc. 2011 Dec. 19(4):348-53. [Medline]. Agout C, Berhouet J, Spiry C, et al. Functional outcomes after non-operative treatment of irreparable massive rotator cuff tears: prospective multicenter study in 68 patients. Orthop Traumatol Surg Res. 2018 Aug 2. [Medline]. Collin PG, Gain S, Nguyen Huu F, Ladermann A. Is rehabilitation effective in massive rotator cuff tears?. Orthop Traumatol Surg Res. 2015 Jun. 101 (4 Suppl):S203-5. [Medline]. Jain NB, Ayers GD, Fan R, et al. Predictors of Pain and Functional Outcomes After the Nonoperative Treatment of Rotator Cuff Tears. Orthop J Sports Med. 2018 Aug. 6 (8):2325967118788531. [Medline]. [Full Text]. Ebenbichler GR, Erdogmus CB, Resch KL, et al. Ultrasound therapy for calcific tendinitis of the shoulder. N Engl J Med. 1999 May 20. 340(20):1533-8. [Medline]. Wilk KE. Shoulder rehabilitation. In: Physical Rehabilitation of the Injured Athlete. Philadelphia:. 1998:478-553. Graver JL. Pathologie degenerative de la coiffe des rotateurs, place de la physiotherapie. Rev Rhum (suppl pédagogique). 1996. 63(1):74sp-81sp. Gutierrez-Espinoza H, Arriagada-Nunez V, Araya-Quintanilla F, et al. Physical therapy in patients over 60 years of age with a massive and irreparable rotator cuff tear: a case series. J Phys Ther Sci. 2018 Aug. 30 (8):1126-30. [Medline]. Chan K, MacDermid JC, Hoppe DJ, et al. Delayed versus early motion after arthroscopic rotator cuff repair: a meta-analysis. J Shoulder Elbow Surg. 2014 Aug 12. [Medline]. Chang KV, Hung CY, Han DS, et al. Early Versus Delayed Passive Range of Motion Exercise for Arthroscopic Rotator Cuff Repair: A Meta-analysis of Randomized Controlled Trials. Am J Sports Med. 2014 Aug 20. [Medline]. Thigpen CA, Shaffer MA, Gaunt BW, Leggin BG, Williams GR, Wilcox RB 3rd. The American Society of Shoulder and Elbow Therapists' consensus statement on rehabilitation following arthroscopic rotator cuff repair. J Shoulder Elbow Surg. 2016 Apr. 25 (4):521-35. [Medline]. Lin MT, Chiang CF, Wu CH, Huang YT, Tu YK, Wang TG. Comparative Effectiveness of Injection Therapies in Rotator Cuff Tendinopathy: A Systematic Review, Pairwise and Network Meta-analysis of Randomized Controlled Trials. Arch Phys Med Rehabil. 2018 Aug 1. [Medline]. Ramirez JP, Bonati-Richardson F, Garcia MP, et al. Intra-articular treatment with corticosteroids increases apoptosis in human rotator cuff tears. Connect Tissue Res. 2018 Aug 9. 1-8. [Medline]. Cacchio A, De Blasis E, Desiati P, et al. Effectiveness of treatment of calcific tendinitis of the shoulder by disodium EDTA. Arthritis Rheum. 2009 Jan 15. 61(1):84-91. [Medline]. Subchondral sclerosis of the humeral head as seen in chronic tendinopathy. 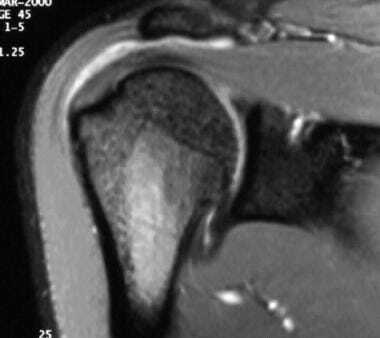 Calcification at the insertion of the rotator cuff, another sign of chronic tendinopathy. 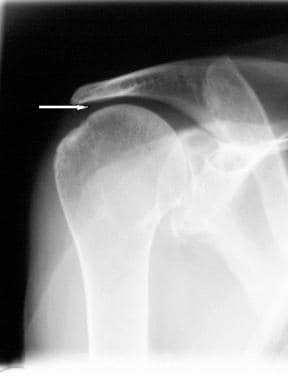 Normal double-contrast arthrography of the shoulder. Complete rotator cuff tear with presence of contrast medium in the subacromial-subdeltoid bursa. Also note the multiple irregularities in the synovial fluid showed as multiples filling defects. Computed tomography (CT)-arthrography scan of the shoulder in the axial plane. Note the presence of air and contrast in the subacromial-subdeltoid bursa. Full-thickness tear of the supraspinatus seen as a hyperintensity line through the full thickness of the tendon (as viewed in a flash 2-dimensional magnetic resonance imaging [MRI] sequence in the coronal oblique plane). Calcifications are seen as hypointense foci in flash 2-dimensional. Arthro–magnetic resonance imaging (MRI) can help to identify labral tears, as seen in this image. The contrast medium penetrates between the labrum and the articular surface. Ultrasonography is another modality that can demonstrate a complete rotator cuff tear. This image reveals a gap of more than 2 cm between both extremities of the torn tendon.